He knows it could have been worse. Speedy New Britain center fielder Ben Revere understands that while suffering a season-ending injury is a big disappointment, it's nothing compared to struggling with his sight and not being able to play baseball the rest of his life. But after Erie's Duane Below delivered a pitch that hit Revere in the face Aug. 3, breaking the orbital bone under his right eye in two places, there were many intense days for Revere, who underwent a CT scan and other tests and visited specialists to determine the extent and potential consequences of the frightening injury. It has just been that kind of year for Revere, whose injuries have piled up one after another. In addition to the beaning, Revere has endured a hamstring strain, was kneed in the eye trying to break up a double play, twisted an ankle and was spiked by a catcher while making a head-first slide, an injury that required stitches. But instead of sending Revere home after this latest injury and telling him to go live safely in a bubble, the Twins have had him remain with the Rock Cats as they complete the last three weeks of the season. "They really want to keep me here and active," said Revere, who continues to travel and work out with the team as the Rock Cats' disappointing 2010 campaign winds down. "I can still swing a little bit, so staying helps keep my body loose and in shape while I get ready for the [Arizona] Fall League." 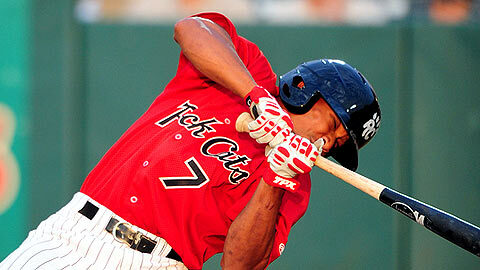 Playing in the AFL remains a possibility -- if Revere can find a way to protect his face. "Our trainer here said Rawlings is trying to make a special helmet for me, with something to protect that side of my face," he said. "Hopefully, it gets in pretty soon and I can test it out, so I can use it before the Fall League, to get used to it." Revere was batting a team-high .297 in 86 games before the injury and ranked second in the Eastern League with 31 stolen bases. With the Rock Cats having the worst record in the 12-team league (34-87), watching Revere play gave New Britain fans a reason to come out to games. "It's been a tough season in many ways," said Revere, who entered the year with a .337 batting average in 254 Minor League games. "But it's the way sports go sometimes. You just gotta fight through it. "I'm also very lucky. This could have been so worse in many ways. If that ball would have gotten closer to hitting my eye, who knows what would have happened." The 5-foot-9, 175-pound ball of energy was drafted out of high school in Lexington, Ky., in the first round of 2007. He is the third member of his close-knit family to be drafted, but the first to sign and begin a promising path to the Major Leagues. The way the upbeat Revere chooses to see it, it's a path that's allowing him to get all the setbacks out of the way in one season. One for the books: Altoona RF Miles Durham hit a walk-off home run in the bottom of the 19th inning Friday, lifting the Curve to a 4-3 win over New Hampshire. The contest took five hours and 49 minutes, the longest home game in franchise history. The first-place Curve wrapped up a 2-0 victory in two hours and eight minutes the next night. He's back: Rehabbing Baltimore OF Lou Montanez went 3-for-4 in a 9-2 loss to Portland on Thursday, extending his club-record hitting streak to 23 games, dating back to July 17, 2008, and including a Major League rehab stint in 2009. Montanez won the Triple Crown and Most Valuable Player awards in the Eastern League in 2008, setting a Baysox franchise record with a .335 batting average while finishing with 26 home runs and 97 RBIs. He became just the fifth Eastern League player to win the Triple Crown and the first in more than 30 years. "I'm really happy I extended it. I'm happy it's still active," Montanez said in a Baysox press release. "Who knows? Maybe someday down the road I'll come back and keep it going." Odds and ends: Bowie RHP Eddie Gamboa picked up his fourth consecutive decision Saturday, leading the Baysox past Erie, 10-4, and snapping the Sea Wolves' eight-game winning streak. ... Akron pounded New Britain pitching for 17 hits, including a franchise record-tying three triples, in an 11-7 victory Friday. ... The Baysox and Orioles agreed to extend their Player Development Contract through the 2014 season. ... New Hampshire matched a franchise record with 17 strikeouts in a 5-3 loss to Richmond in 14 innings Wednesday. The Flying Squirrels walked off winners thanks to a two-run homer by 1B Brandon Belt. ... For the second time in the series, and the third time on the road trip, nine innings were not enough for New Hampshire as the Fisher Cats took 11 frames to edge Altoona, 3-2, on Sunday. Stephanie Storm is a contributor to MLB.com. This story was not subject to the approval of the National Association of Professional Baseball Leagues or its clubs.